147:5.3 On this particular occasion at Simon's house, among those who came in off the street was a woman of unsavory reputation who had recently become a believer in the good news of the gospel of the kingdom. This woman was well known throughout all Jerusalem as the former keeper of one of the so-called high-class brothels located hard by the temple court of the gentiles. 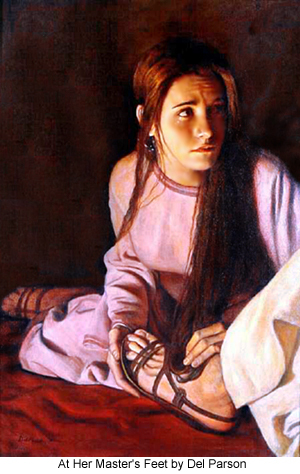 She had, on accepting the teachings of Jesus, closed up her nefarious place of business and had induced the majority of the women associated with her to accept the gospel and change their mode of living; notwithstanding this, she was still held in great disdain by the Pharisees and was compelled to wear her hair down — the badge of harlotry. This unnamed woman had brought with her a large flask of perfumed anointing lotion and, standing behind Jesus as he reclined at meat, began to anoint his feet while she also wet his feet with her tears of gratitude, wiping them with the hair of her head. And when she had finished this anointing, she continued weeping and kissing his feet. 147:5.7 That same evening Jesus made the long-to-be-remembered address to the apostles regarding the relative value of status with God and progress in the eternal ascent to Paradise. Said Jesus: "My children, if there exists a true and living connection between the child and the Father, the child is certain to progress continuously toward the Father's ideals. True, the child may at first make slow progress, but the progress is none the less sure. The important thing is not the rapidity of your progress but rather its certainty. Your actual achievement is not so important as the fact that the direction of your progress is Godward. What you are becoming day by day is of infinitely more importance than what you are today..
Luke 7: 36-50 One of the Pharisees asked him to eat with him, and he went into the Pharisee's house, and took his place at table. And behold, a woman of the city, who was a sinner, when she learned that he was at table in the Pharisee's house, brought an alabaster flask of ointment, and standing behind him at his feet, weeping, she began to wet his feet with her tears, and wiped them with the hair of her head, and kissed his feet, and anointed them with the ointment. 39 Now when the Pharisee who had invited him saw it, he said to himself, "If this man were a prophet, he would have known who and what sort of woman this is who is touching him, for she is a sinner." And Jesus answering said to him, "Simon, I have something to say to you." And he answered, "What is it, Teacher?" "A certain creditor had two debtors; one owed five hundred denarii, and the other fifty. When they could not pay, he forgave them both. Now which of them will love him more?" Simon answered, "The one, I suppose, to whom he forgave more." And he said to him, "You have judged rightly." Then turning toward the woman he said to Simon, "Do you see this woman? I entered your house, you gave me no water for my feet, but she has wet my feet with her tears and wiped them with her hair. You gave me no kiss, but from the time I came in she has not ceased to kiss my feet. You did not anoint my head with oil, but she has anointed my feet with ointment. Therefore I tell you, her sins, which are many, are forgiven, for she loved much; but he who is forgiven little, loves little." And he said to her, "Your sins are forgiven." Then those who were at table with him began to say among themselves, "Who is this, who even forgives sins?" And he said to the woman, "Your faith has saved you; go in peace."